Gvpngate is a VPN Gate frontend for Gnome Network Manager. Gvpngate will will create OpenVPN connection entries based on the list of free vpn servers provided by the VPN Gate project. For more information concerning the VPN Gate project please visit www.vpngate.net. Valid connections will remain in Gnome Network Manager, even after Gvpngate is closed. 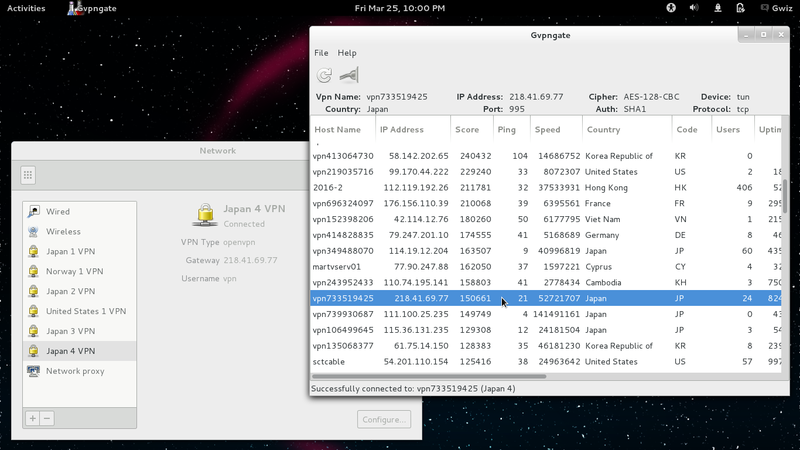 To remove connections created by Gvpngate, use Gnome's Network Settings dialog. Gvpngate is not required to be running to use the created connections. Source archives, Debian packages and RPM packages are available on the Gvpngate Downloads page. Start Gvpngate by typing 'gvpngate' in a terminal window (as a regular user, not as root) or by selecting the Gvpngate icon in the Applications menu or in Dash. 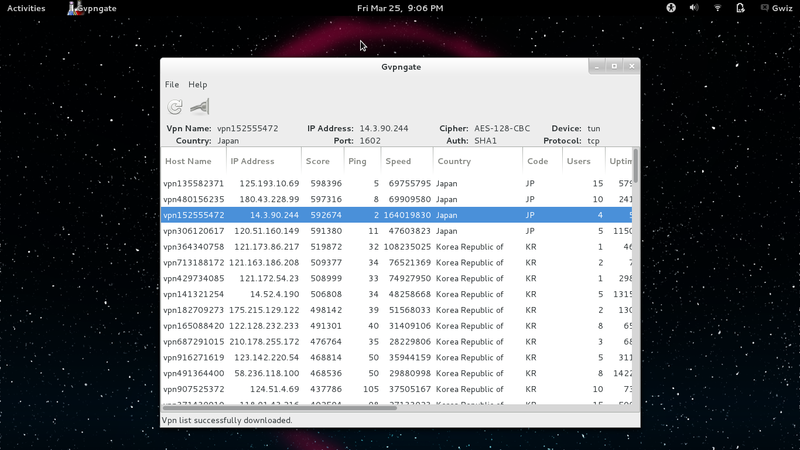 Usage of Gvpngate is very straightforward, after the vpn list loads, select a vpn from the list and create a Gnome Network Manager connection by selecting "Connect" from the menubar, pushing the "Connect" button or by double-clicking on an entry in the vpn list. Gvpngate will create the connection and attempt to connect to it. If the connection fails, Gvpngate will remove the connection from Gnome Network Manager. If the connection succeeds, the connection will remain available in Gnome Network Manager, even after Gvpngate is closed. To refresh the vpn list, select "Refresh" from the menubar or push the "Refresh" button. If downloading of the vpn list fails, Gvpngate will attempt to use a previously downloaded vpn list. The CA Certificate files for the created vpn connections are stored in a directory named ".gvpngate" in the current user's home directory. While Gvpngate need not be running to access the created connections, access to the ".gvpngate" directory is required. Gvpngate deletes any unused certificate files on shutdown. The VPN Gate servers do not appear to support IPv6 at this time and as a result neither does Gvpngate. To avoid leaking your IPv6 address and/or your IPv6 DNS inquiries, I suggest following the recommendations at https://wiki.debian.org/DebianIPv6#How_to_turn_off_IPv6 for Debian or a similar work-around for your distro.